Ruby Dee, guitarman Jorge Harada and crew serve up 200 proof rockabilly. 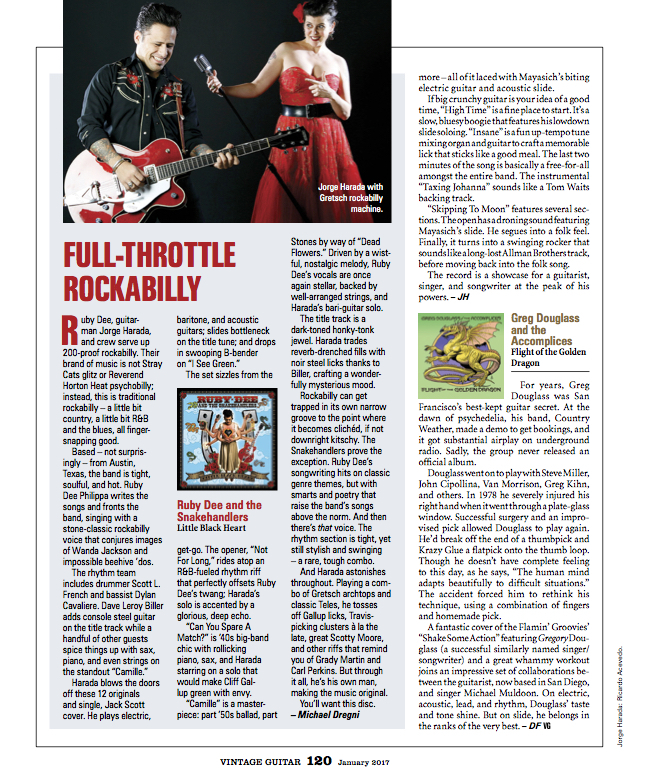 Their brand of music is not Stray Cats glitz or Reverend Horton Heat psychobilly; instead, this is traditional rockabilly – a little bit country, a little bit R&B and the blues, all finger-snapping good. Based– not surprisingly– from Austin, Texas, the band is tight, soulful, and hot. Ruby Dee Philippa writes the songs and fronts the band, singing with a stone-classic rockabilly voice that conjures images of Wanda Jackson and impossible beehive ’dos. The rhythm team includes drummer Scott L. French and bassist Dylan Cavaliere. Dave Leroy Biller adds console steel guitar on the title track while a handful of other guests spice things up with sax, piano, and even strings on the standout “Camille.” Harada blows the doors off these 12 originals and single, Jack Scott cover. He plays electric, baritone, and acoustic guitars; slides bottleneck on the title tune; and drops in swooping B-bender on “I See Green”. The set sizzles from the get-go. The opener, “Not For Long,” rides atop an R&B-fueled rhythm riff that perfectly offsets Ruby Dee’s twang; Harada’s solo is accented by a glorious, deep echo. “Can You Spare A Match?” is ’40s big-band chic with rollicking piano, sax, and Harada starring on a solo that would make Cliff Gallup green with envy. “Camille” is a master- piece: part ’50s ballad, part Stones by way of “Dead Flowers.” Driven by a wistful, nostalgic melody, Ruby Dee’s vocals are once again stellar, backed by well-arranged strings, and Harada’s bari-guitar solo. The title track is a dark-toned honky-tonk jewel. Harada trades reverb-drenched fills with noir steel licks thanks to Biller, crafting a wonderfully mysterious mood. Rockabilly can get trapped in its own narrow groove to the point where it becomes cliched, if not downright kitschy. The Snakehandlers prove the exception. 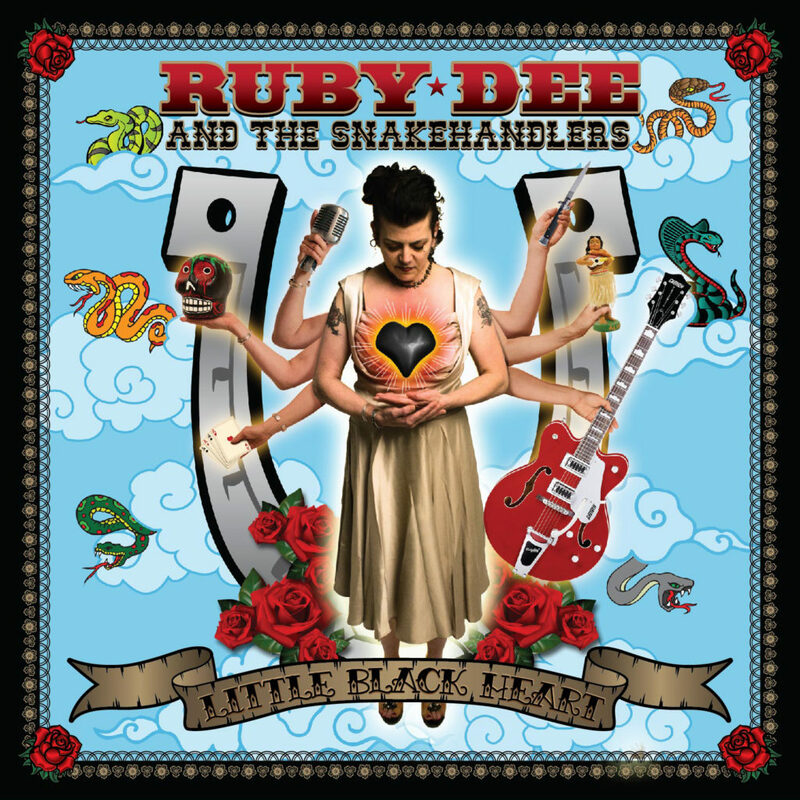 Ruby Dee’s songwriting hits on classic genre themes, but with smarts and poetry that raise the band’s songs above the norm. And then there’s that voice. The rhythm section is tight, yet still stylish and swinging– a rare, tough combo. And Harada astonishes throughout. Playing a combo of Gretsch archtops and classic Teles, he tosses off Gallup licks, Travis-picking clusters àla the late, great Scotty Moore, and other riffs that remind you of Grady Martin and Carl Perkins. But through it all, he’s his own man, making the music original. You’ll want this disc.